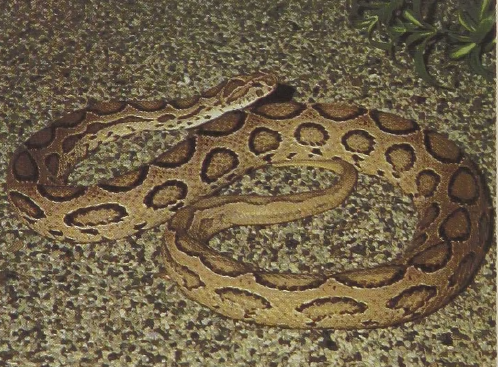 Russell’s Viper, or Daboya, is a large, beautiful, and deadly snake, the Tic polonga of the Indies. The species’ range is from India to Indonesia. It has a highly potent, mainly tissue-destroying venom, which often acts quite slowly but progressively, and which also shows strong inhibition of blood coagulation. 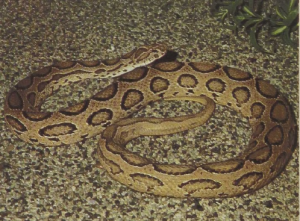 Russell’s Vipers are easily recognized by the discrete brownish blotches on the back, each of which contains a hollow center outlined by a black line. When disturbed these snakes produce a very deep, penetrating, and protracted hissing sound. The snake, which may reach a length of 5 feet, gives birth to up to 66 live young, which are born in midsummer. The Daboya is an effective predator on rodents and has been known to enter farms and village huts in search of its prey.